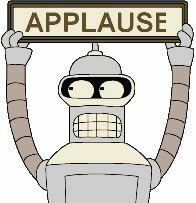 FUTURAMA Picked Up for 26 Episodes! A couple days ago, we broke the story that “Futurama” was coming back to television on Comedy Central. We got one part of the story wrong: we said they were picked up for 13 episodes and today Variety and Michael Ausiello are saying it’s a 26-episode order and in this instance, I’m certainly happy to be wrong because more “Futurama” is better “Futurama”. Lead voice actors Billy West (Phillip J. Fry), Katey Sagal (Leela) and John DiMaggio (Bender Bending Rodriguez) have all signed on to return. This is great news for Futurama fans and hopefully the episode-by-episode format will be more conducive to better writing than the controversial movies which received mixed reactions from fans (although I think that “Bender’s Big Score” is great).